Kombucha tea as a cure-all for a wide range of conditions with warnings! Kombucha Tea - mystical elixir! 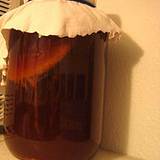 Kombucha tea is made by fermenting sweetened black tea with a flat, pancake-like culture of yeasts and bacteria called the "Kombucha mushroom". I call it the "SCOBY" - symbiotic colony of bacteria and yeast. Saccharomycodes ludwigii, Schizosaccharomyces pombe, Brettanomyces bruxellensis, Bacterium xylinum, Bacterium gluconicum, Bacterium xylinoides, Bacterium katogenum, Pichia fermentans, Candida stellata and Torula species, among others. Because there are several types of yeast and bacteria that can grow under these conditions, different Kombucha brews may contain different types strains. Since cultures and preparation methods vary, Kombucha tea may contain contaminants such as molds and fungi, some of which can cause illness. That is why it is so important to use a known safe strain when initiating a SCOBY culture. After the tea is made, it is usually highly acidic and contains alcohol, ethyl acetate, acetic acid, and lactate. Kombucha tea has been promoted as a cure-all for a wide range of conditions including baldness, insomnia, intestinal disorders, arthritis, chronic fatigue syndrome, multiple sclerosis, AIDS, and cancer. Supporters say that Kombucha tea can boost the immune system and reverse the aging process. Kombucha tea is said to contain antioxidants, compounds that block the action of free radicals (activated oxygen molecules that can damage cells). For people who have cancer, proponents claim the tea can improve the body's defenses (especially in the early stages of cancer) by detoxifying the body and enhancing the immune system. After the body has been detoxified, the tea is said to help repair and balance the body and fight off disease. 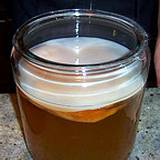 Kombucha cultured drink is made by steeping the "mushroom" culture or SCOBY in tea and sugar, preferably brown raw, for about a week. During the process, the original mushroom floats in the tea and produces a new "baby mushroom" on its surface. These new mushrooms can be passed along to other people for starting their own cultures or can be stored to make new batches of the tea when the original mushroom "goes bad" (indicated when it turns black or green). Start drinking the fermented concoction in very small daily doses of the tea (1 to 2 ounces), and slowly increasing it over a few days or weeks. Some proponents also encourage people to remove all chemicals from their diets and eat only fresh fruits and vegetables in order to help the "detoxification" process. They may also be advised to quit smoking and avoid caffeine, soft drinks, alcohol, hormone-fed meat, fertilized or sprayed foods, preservatives, and artificial coloring and flavoring. The history of kombucha tea originated in East Asia and was later introduced to Germany at the turn of the century. Since the early 19th century, this fermented tea has been promoted as an immunity-boosting tea that can strengthen the body against many ailments. It became more widely used in the United States these days, partly because it can be made at home. It is especially popular among people with HIV and the elderly because of claims it can boost immunity and slowing down the ageing process. Disclaimer: No human studies have been published in the available scientific literature that support any of the health claims made for drinking this tea. Moreover, there have been reports of serious complications and death linked to the tea consumption. For the fact that several types of yeast and bacteria can grow under fermentation of the tea's brewing process, the controlled resulting result of consistent production may vary under different conditions and tea used. Since cultures and preparation methods vary, Kombucha tea may contain contaminants such as moulds and fungi, some of which can cause illness. After the tea is fermented, it is usually highly acidic and contains alcohol, ethyl acetate, acetic acid, and lactate. In April 1995, two women who had been drinking the tea daily for 2 months were hospitalized with severe acidosis -- an abnormal increase of acid levels in body fluids. Both had high levels of lactic acid upon hospitalization. One of the woman died of cardiac arrest 2 days after admission. The second woman's heart also stopped, but she was ultimately stabilized and recovered. The mushrooms used by both women came from the same "parent" mushroom. While no direct link to drinking this tea was proven in this case, the U.S. Food and Drug Administration (FDA) has warned consumers to use caution when making and drinking the tea. In 2009, a 22-year-old man was hospitalized with trouble breathing, fever, confusion, and high lactic acid levels within 12 hours after drinking his home-brewed fermented tea. He recovered, but his doctor believed that the tea was the cause of his lactic acidosis. This is a rare but serious and often fatal condition. Because deaths have been linked with the tea, drinking excessive amounts is not recommended. Several experts warn that since home-brewing facilities vary a great deal, the tea could become contaminated with harmful germs. These germs could be especially dangerous to people with HIV, cancer, or other immune problems. Anthrax of the skin has been reported, as has jaundice, a yellowing of the skin and eyes that is usually caused by liver damage. Allergic reactions, possibly to molds in the tea, have been reported. Kombucha tea should not be brewed in ceramic, lead crystal, or painted containers, as the acidity of the tea can cause it to absorb harmful elements from its container. Lead poisoning has been reported in at least two people who brewed the tea in a ceramic pot. It is recommended to use normal glasswares for brewing purposes. Since the potential health risks of consuming such fermented tea are unknown, anyone with an immune deficiency or any other medical condition should consult a physician before drinking the tea. Women who are pregnant or breast-feeding should not use this tea. Relying on this type of treatment alone and avoiding or delaying conventional medical care may have serious health consequences.